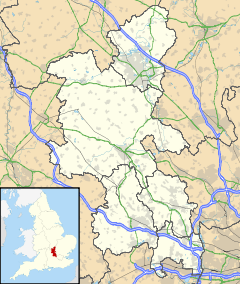 Speen is a village in the Chiltern Hills, an Area of Outstanding Natural Beauty, situated in the civil parish of Lacey Green, in Buckinghamshire, England. As the crow flies, the centre of the village (as depicted by the village sign) is 3.2 miles south east of Princes Risborough, 4.7 miles north of High Wycombe and 31 miles north west of central London. The village is a short distance from Chequers, the country residence of the Prime Minister of the day. The village name originates from Anglo Saxon. The exact meaning is unclear, but possibly meaning 'wood-chip place'. The name of the village corresponds to the location of the hamlet in the Chiltern Forest where trees were regularly felled. The village is a mixture of woodland and agricultural fields (including cultivated crops, hay meadow for livestock feed and pasture) and varies in elevation. There are approximately 165 houses in the village which has a population at the time of the 2011 census of 637 and has a current[when?] estimated population of 654. The village has a bi-annual culture and arts festival. The festival runs in September in odd numbered year and the 2017 festival ran from Saturday 2nd September 2017 to Sunday 17th September 2017. The first Speen Festival in 2001 was based on a festival (The Leaves of Time) held in 1999 to celebrate the passing of the Millennium. In 1928 the artist Eric Gill moved to Pigotts at Speen, where he set up a printing press, and lettering workshop and alternative community. ^ "Speen (Buckinghamshire, South East England, United Kingdom) - Population Statistics and Location in Maps and Charts". www.citypopulation.de. Retrieved 2017-07-14. ^ "Speen Festival 2017". www.speenfestival.org. Retrieved 2017-07-14. ^ "Font Designer - Eric Gill". Retrieved 1 January 2009. This page was last edited on 4 March 2019, at 05:24 (UTC).